An excellent gift idea, and a fine desk accessory! This premium Black Leather Book Weight is among the highest quality book weights and reading tools you can buy. It is made from real, genuine leather with weighted inserts. An exceptional gift idea for students, readers or teachers. This leather book weight is made with durable, genuine black leather and thread stitching. On each rounded end there is a weighted metal insert. The book weight lays across an open book open to keep your place while you read. It prevents damage to a book's spine and is a fine gift idea for teachers and executives. 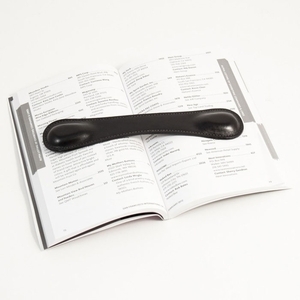 The black leather book weight is an excellent gift for a student, teacher or librarian. Also a fine accessory or the astute executive and an excellent accessory for a home library. They are offered at this special low price. Dimensions: 8 1/2" x 1 3/4"
This classic black leather book weight is an excellent choice for the den or library. Lay the elegant book weight on any open book to keep your place while you research or read aloud. This useful accessory will find a niche in your office and become a respected accent to your desk set. Leather book weights are a wonderful gift for students, researchers, a secretary or instructor.